There are indications that the 2019 general election is facing fresh hurdles as members of the National Assembly joint committee sitting on the Independent National Electoral Commission (INEC) budget proposal went into rancorous argument along party lines yesterday. The committee had summoned INEC chairman, Professor Mahmood Yakubu, to appear before it yesterday to make further clarifications on the N189 billion proposed by him against the N143 billion requested by President Muhammadu Buhari for National Assembly’s approval for next year’s elections. Consequently, the minister of Budget and National Planning, Udoma Udo Udoma; senior special assistant to the president on National Assembly Matters, Senator Ita Enang, and some INEC commissioners appeared before the committee yesterday. LEADERSHIP Weekend reports that after submissions were made by representatives of the executive, the debate for approval of either of the sums among members of the National Assembly joint committee on INEC followed party lines with lawmakers on the platform of the ruling All Progressives Congress (APC) arguing for the approval of the entire sum of N189billion while those belonging to the Peoples Democratic Party (PDP) argued that the N143billion requested by President Buhari in his virement-seeking letter be approved since the balance of N45.6billion will be included in the 2019 budget. The dilemma of the lawmakers on which of the proposals to approve was worsened with the submission by Udo Udoma who told the lawmakers that they had the discretion to choose. The minister, who made the submission upon request to that effect by the chairman of the committee, Senator Suleiman Nazif (PDP, Bauchi North), explained to the committee that the N189billion requested for by INEC was the same amount the president wrote in the letter, but that because of funding constraints, President Buhari decided to break the approval for it into two-fold by seeking virement for N143billion for INEC this year while the balance of N45.6billion would be taken care of in the 2019 budget . According to him, if the joint committee wished to approve the entire N189billion without causing an increase in the N9.12trillion 2018 budget size, the executive appreciate it. “Mr President will have no objection to the National Assembly approving the entire N189billion INEC budget as long as it does not in anyway lead to increase in the overall size of the 2018 budget . “If this is to be done, the N45.6billion the president in his letter proposed to be provided for in the 2019 budget would also have to be vired along with the N143bn from the N578bn fund appropriated for in the 2018 budget by the National Assembly for the additional 1,403 projects included in the budget,” he said But when asked whether he had authorisation to the submission he made for the approval of the N189billion as against the N143bn requested by the president for INEC this year, the minister said: “Discretion on which of the requests to be approved by you now is yours. If you approve the N143bn the president requested for, it is okay, and if you approve the entire N189billion for INEC this year, it is also all right. “Any of the two is okay for the executive, except that if you approve the N189billion through virement, the N45.6 billion planned to be captured in the 2019 budget would no longer be part of the budget estimates for that year,” the budget minister explained. LEADERSHIP Weekend observed that heated arguments by lawmakers along party lines followed Udoma’s submissions. PDP senators like Mohammed Hassan (Yobe South), Isa Misau (Bauchi Central), Hon Wole Oke (Osun), and Hon Ogbeideihama Omorege (Edo) among others argued that the N143bn requested by the president should be approved while their APC counterparts like Senators Ibrahim Kurfi (Katsina Central), Aliyu Sabi Abdullahi (Niger North), Ovie Omo -Agege (Delta Central) and Hon Aisha Dukku (Gombe) among others insisted that the entire sum of N189billion be approved Senator Hassan (PDP) said, “According to Section 81(4) (a) which states that if in respect of any financial year it is found that the amount appropriated by the Appropriation Act for a supplementary estimate showing the sums required shall be laid before each House of the National Assembly and the heads of any such expenditure shall be included in a supplementary Appropriation Bill’, it is therefore wrong to approve outside what Mr President who is the c-in-c has submitted.’’ Senator Misau (PDP) said, “What Minister Udoma submitted has complicated the whole issues. We are now more confused than we were yesterday. As it is, we don’t know what the content of the document he tendered contains. We can’t therefore proceed from this point without referring the document to the Appropriation Committee to decide on source of the money to accommodate the proposal. We can’t put something on nothing, as anything we propose now amounts to nothing’’. Senator Omo-Agege (APC), however, countered him, saying: “We have to adopt the N189 billion proposed by INEC. We have to approve that at o0nce without breaking it into two, because by so doing the committee would have freed itself of double approval. Why must we sit for now only to come back to sit again on what we could have done at once. We must put INEC in good stead to conduct free and fair elections come next year.’’ On his part, Sabi Abdullahi (APC) said, “We have look at the duty before us now from a nationalistic perspective. N189 billion is what INEC said is required to conduct good elections next year. This committee has the right to consider the N189 billion proposal and thereafter refer it to Appropriation committee. We have to divest ourselves of argument that won’t be of national interest’’. Hon (Mrs) Dukku affirmed that the consideration of the N189 billion was the right step to take by the committee. Apparently disturbed by the development, the committee chairman, Suleiman Nazif, in his remarks said the reason for inviting the budget minister, the presidential liaison officer in the National Assembly, Senator Ita Enang, and INEC officials was to enable Nigerians to see that the committee was transparent, nationalistic and not in any way partisan. “We are not here to play politics with the 2019 election budget. There is no confusion, no ambiguity on submissions made and requests before us. “It is our prerogative as a committee to critically look into all the details and recommend either of the two requests for approval by committee of the whole at both chambers,” he said and accordingly adjourned the meeting sine die. 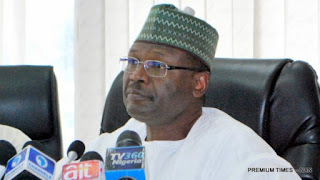 No N700m Budget For International Observers – Yakubu Meanwhile, INEC chairman, Mahmoud Yakubu, has dismissed reports that the commission had budgeted the sum of N700 million to cater for international election observers in the 2019 general elections. He also dismissed reports that the commission budgeted N6bn for feeding of policemen for the elections. Speaking to State House Correspondents yesterday, Yakubu clarified that what the commission was providing for were standard electoral monitoring kits which include face caps, stickers, publications and jackets among others, which was a standard international practice. He said, “I have heard this question that we have prepared budget for international observers, there is no such thing. There is no line in the budget for international observers. What we are providing for are the kits, you know, the jackets, caps, publications, that we give to international observers, the stickers that are fixed on their cars to be identified on Election Day. This is the standard practice. “Each country that organises elections provides these facilities for those who monitor elections, but their accommodation and transportation will be borne by various election monitoring groups and not by the Nigerian government.” On voter registration extension, the INEC boss said it was extended in response to the appeals by Nigerians, adding that the registration will include weekends but exclude public holidays. Yakubu said, “Well, you know we started the continuous voter registration exercise on 27th April, 2017, so we have been, as provided for in our constitution, registering voters consistently in the last 16 months. In response to appeal by Nigerians, we have created more centres for the registration but finally decided that we should suspend the process, as provided for by the law, six months to the elections. “But again, in response to appeals by Nigerians, we have now extended to the end of the month. As at Saturday last week, the 11th of August, we had registered 12.1 million citizens. This will eventually be added to the 70 million voters already registered for the 2019 general elections. We have a voters’ register of over 80 million citizens. “Let me make this very important clarification, the registration is going to take place between 9am and 5pm daily, including weekends but excluding the public holidays. “The second important clarification that I should make is that the second voter registration exercise, the end of the continuous voters registration is 31st of August, but that does not mean the end of the collection of PVCs. Collection of PVCs will continue until at least one week to the general election in February 2019.” Asked if he was worried that the virement is still before the National Assembly few months to the general elections, Yakubu said , “Well, we have made the clarification that the National Assembly asked for and I am happy that the National Assembly and the two committees on INEC expressed satisfaction on the clarification that we made for the matter of appropriation. So we look forward to hearing what the National Assembly will say.” On conflicting figures for the 2019 elections budget, the INEC boss said there are no discrepancies in the figures. “The commission requested N189.2 billion; that is what the executive proposed to the National Assembly, so there are no discrepancies in the figures at all.” He also dismissed insinuations that the 2019 election may be postponed, saying there are no conditions under which the elections would be postponed. “I have said this over and over again, there are no conditions under which elections should be postponed. “Under section 26 of the Electoral Act, the date is fixed – February 16, 2019. We issued the timetable way in advance for the very first time in the history of our nation. Citizens of Nigeria know when elections will take place one year in advance. It has never happened before. “Secondly, also for the very first time in the history of our country, citizens know the budget of the electoral commission. That budget has never been defended before the National Assembly. Now, citizens know line by line how much the commission proposed, what the money is going to be spent on, I think I am very happy with this process,” Yakubu said. On why he came to the presidential villa, he said, “It has nothing to do with our national politics. Recall that in March 2016, I was elected the President of ECOWAS network of electoral commission. In that capacity recently, we undertook a NEEDS assessment visit to the Republic of Guinea-Bissau and part of what they request for Nigeria is assistance with voters’ registration kits. “Since I returned a little over two weeks ago, I have received daily calls from the electoral commission, and this afternoon (Friday), the ambassador of Guinea-Bissau to Nigeria, they want to start the voter registration on the 23rd of this month but they are relying on Nigeria to provide the assistance.” “That is why I came and had a meeting with Ambassador Lawal, with the senior special assistant to the president on foreign affairs to facilitate Nigeria’s electoral assistance to Guinea-Bissau. “It is important to do so because you should also remember that for several years now, Nigeria has had troops in Guinea-Bissau to stabilise the country and that stability is dependent upon the conduct of proper elections. Once elections are conducted, Nigerian troops can now safely withdraw. So it’s much cheaper for Nigeria to provide this assistance,” he explained. Voters Registration Gulps N5bn The Independent National Electoral Commission (INEC) has spent the sum of N5.1bn (N5,124,473,950.00) on its continuous voter registration (CVR) exercise, which ends this month. The CVR exercise, which commenced on April 27, 2017, has recorded 18.1 per cent increase in the number of registered voters since the last general election. With the CVR ending on August 31, 2018, INEC has pegged its estimated cost at about N5.1billion, with the number of registered voters exceeding 81 million.